We see the world with two eyes but an inner eye processes the input. I call the inner eye perception. Eye witness accounts of the same event can produce different explanations. Andrew Roberts, a lecturer in law at Leeds University provides an excellent example. It is not surprising therefore that two people gazing at a large sea swell can see it in quite different ways. One sees the swell as excellent for surfing while the other sees it as a danger to be avoided at all costs. This perception-variance is not produced by the two eyes in the front of the head but by the inner eye of perception. Information passing through our eyes is filtered by the brain. Mercifully we can change the filters and doing so will often turn a stressful event into one we can ignore or discard. If you would like to get a real feel for how the brain processes information that flows through the eyes look at the object below. 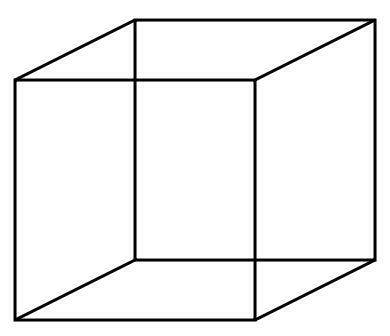 This object, called a Necker Cube, will involuntarily change from time to time as you study it. Weird isn’t it! If the brain flips a simple object around what does it do to more complex objects? If you find it difficult to get a new perspective then ask others what they think – what they are seeing. Knowledge gained in this way will certainly give you some different views. Effective personal stress management always involves the third eye of perception. So take a daily hassle and get a new perspective on it and see if you can make it irrelevant.